Queen Anne's Lace is a delicate flower that blends magically with other greens to give a full performance in centerpieces and floral arrangements. The little white blossoms alone can make a tiny bouquet. It is one of the few types of filler that can be used alone or with other flowers. It is highly favored and available year round. The real and scientific name of the Queen Anne's lace flower is Daucus carota, and another name is a Wild carrot. According to legend and stories, Queen Anne of England pitched her finger and from there, a drop of blood fell on the lace that was white that she was working with. It was the early Europeans who cultivated it, and the Romans who consumed it as a vegetable. These taproots were boiled in wine by many American colonists. Surprisingly the flower has a high sugar content, coming second to beetroot. It's often even used by the Irish, Jews, and Hindus to sweeten foods like puddings and desserts. The Queen Anne's lace flower looks a lot like an intricate lace pattern. It's small white flowers not only make exceptional filler flowers but is widely used in culinary and other cultures too. It's often spotted with a single dot of purple in the middle. The flat-topped white umbel flowers blossom from late spring and they bloom until mid-fall. The flowers are a cluster of a number of small white flowers and cult upwards to open and which helps in pollination. The bunch of the flowers closes again in the form of a reverse umbrella into the seed once the season is at an end. Apparently, there are many medicinal benefits to this plant as well. Vitamins and mineral contents have been found in Queen Anne's lace flower. They grow tall and average to about one meter mostly growing in meadows, roadsides, fields or any disturbed area as well. This shows that they are very hardy and thrive well in dry environments too. The leaves of this flower are feathery and are closely similar to house carrots. The base of the leaves where the stalk ends are flat as well as broad, and these leaves also resemble the poisonous hemlock and fool's parsley. The simple way to distinguish them is through smell. While the poisonous hemlock and its poisonous cousin fool's parsley has a disgusting smell, Queen Anne's lace smells just like a carrot. A lot of people have died eating what they thought was the root of wild carrots. That's why its consumption is not very much altogether. Also, its roots are sweet only when they are young and quickly turn woods as the plant ages. But there has been a long history of cultivating it for food. The roots were used to make tea, or in soups and stews. The leaves and flowers can be chopped and used in salads.The seeds are used in stews and soupsas a flavoring. 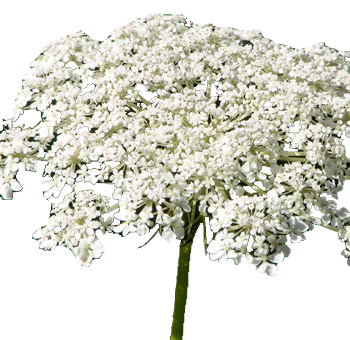 There are numerous medicinal and culinary uses of the Queen Anne's lace flower. It's literally even used as a dyestuff for a creamy white color on cloth. But how is this plant used today? Unfortunately, they are now considered as evasive weeds in many areas. And are often cut off without much thought. But they can be a great growing companion to man crops. Apart from this, the Queens Anne lace is especially popular in the cut flower market. Factually these flowers make amazing fillers and can be added to centerpieces and bouquets. The Queen Anne's flowers, when used in bouquets, help to even out the shape, fill and overall bring the whole arrangement together. They are available all year round and are also easily provided by all florists or wholesalers. The Queens Anne white lace flower and bouquet paired with red roses is a classic combination. This can be added into a composite bouquet or a rustic looking one garden roses and peonies. Both of which create magical and whimsical bouquets for brides on their wedding day. The Queen Anne's lace flower is surprisingly popular in the cut flower trade even after having a reputation of evasive weeds in farmlands and places because of their hardy surviving nature. The florist's industry has seen the beauty of this flower and the way it can be used as fillers. It's generally known for filling up bouquets and centerpieces, but the surprising thing is that they work wonderfully well on their own too. Centerpieces made out of Queen Anne's Lace are especially stunning. If these flowers have caught your fancy, we do think you should buy them in bulk. You might never know where you end up using these beauties. Order lace flowers for sale from a good online wholesaler namely someone like Whole Blossoms. They guarantee not only a fresh flowers delivery but also a delivery right to your doorstep. Their 24/7-hour delivery system is a blessing for event planners or events and weddings planned in urgency. They will cater to all your flower needs at really affordable prices.